I can't remember a Christmas without these cookies. When I was young we used to use Brach's stars instead of the hershey kiss. Then at some point they became hard to find and we switched to the kisses. Does anyone know if Brach's still make their chocolate stars? Chocolate and peanut butter together is hard to beat! Before baking roll in sugar. 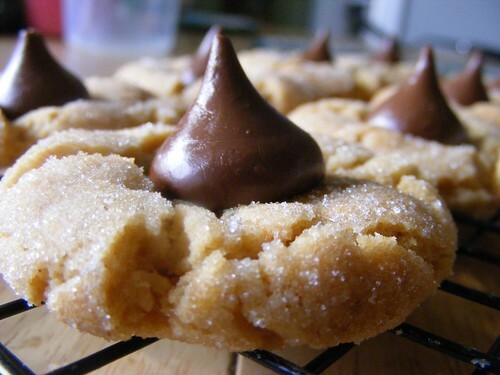 After baking, place candy kiss or star in center of each cookie. If you have a Meijer they sell both a Meijer brand and the Brach's - it is where the bulk candy is. We made them this way for the first time this year and loved them! More chocolate with each bite whereas with a Kiss you tend to just eat the Kiss then the cookie. Chocolate and Peanut Butter were made for each other. Praying for your family. Merry Christmas! Thanks, Steph!! I'll have to check at Meijer the next time I make them.